PlayStation 2 backwards compatibility could be returning to the PlayStation 3, according to what appears to be an internal document accidentally leaked by Sega of America, one that hints at downloadable previous gen games available on a case-by-case basis. That document, uncovered by French gaming web site Objectif-Sega, notes that "SCEA wants to sell all PS2 titles on PSN," which may indicate a strategy similar to the one Sony has taken with original PlayStation games, released as "PSone Classics." The document appears to be a list of notes from a meeting between Sega of America and Robert Dyer, senior vice president of publisher relations for Sony Computer Entertainment America, dated from early August. The notes mention two titles, Grand Theft Auto: Vice City and an unspecified Sonic the Hedgehog game—there are seven Sonic-starring games for the PS2—as examples of candidates for release. If the document is legitimate and the notes are accurate, the plan to offer downloadable PlayStation 2 games makes a good deal of sense. Sony just recently announced the God of War collection, which bundles the first two games in the series on a Blu-ray disc for the PS3, with a handful of enhancements. 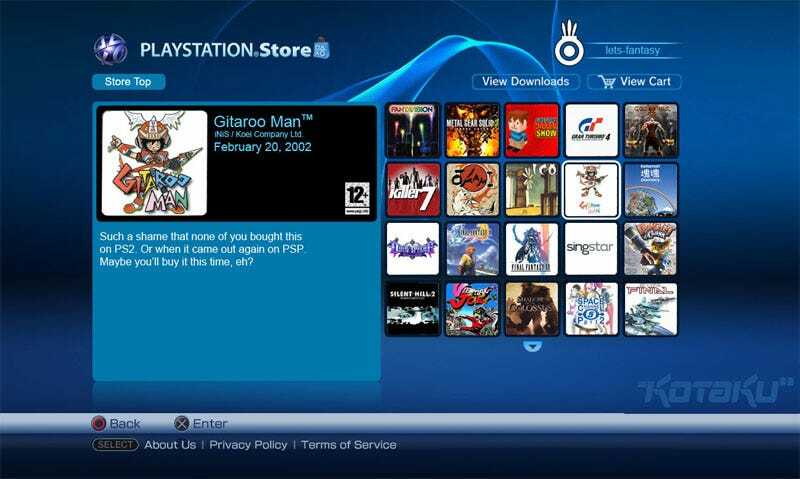 The ability to offer individual games certainly makes a greater deal of business sense, considering the PlayStation 2's 1800 game strong library would offer ample opportunity for profit on digital downloads. The same document also mentions what appears to be downloadable Dreamcast titles for the PlayStation Network. Those titles don't appear to be exclusive to the PlayStation 3, however, as the rumored meeting notes read "If we provide a list of DC titles SCEA will let us know which ones they're interested in having exclusively." We've attempted to verify the validity of the document and are seeking comment with Sega of America and Sony Computer Entertainment, but did not hear back before publishing. And, for the record, the above image is merely a Kotaku-created mock up. Also, the folks at Objectif-Sega appear to have retracted their story at the request of Sega France. For me at least, the document in question appears to still be live at Sega's press FTP.